Home» Garrick News » 101st Season Opens Tonight! 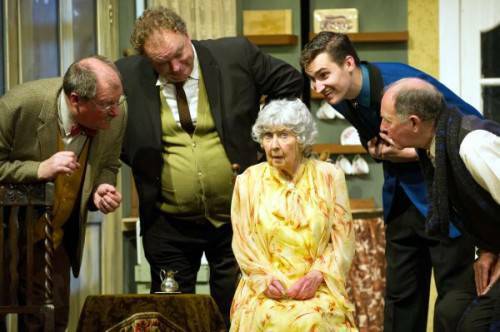 Our 101st season opens tonight with our first show on our Main Stage – ‘The Ladykillers’ by Graham Linehan. This is a hilarious dark comedy based on the famous Ealing comedy film of the same title. Posing as amateur musicians, Professor Marcus and his gang rent rooms in the lopsided house of sweet but strict Mrs Wilberforce. The villains plot to involve her unwittingly in Marcus? brilliantly conceived heist job. The police are left stumped but Mrs Wilberforce becomes wise to their ruse and Marcus concludes that there is only one way to keep the old lady quiet. With only her parrot, General Gordon, to help her, Mrs Wilberforce is alone with five desperate men. But who will be forced to face the music? This award winning comedy was recently seen in the West End. The production photos have just been posted online HERE?- it looks a lot of fun! and tickets are starting to sell fast – so book your seats soon! Don’t forget this season, for most of our productions, we have a Saturday Matinee at 2:30pm and we are also introducing an exciting new look programme on sale in Foyer. Support your local theatre and come and celebrate the opening of our 101st Season!